GARGOT DE LA ROCHETTE, NICOLAS, nicknamed Peg-leg (Jambe de Bois), lieutenant, naval captain, and Chevalier de Saint-Michel, governor of Plaisance; b. 20 Feb. 1619 at La Rochelle (France), son of Hilaire Gargot and Anne Lardeau; d. and buried 16 Dec. 1664 in that same city. Gargot was a grandson of the La Rochelle sailor, Jacques Lardeau, who had saved young Henri IVs life. His father, an eminently respectable man, was a Huguenot merchant but did not belong to the upper middle class. Nicolas was converted to Catholicism. His elder brother, Jean, traded along the coasts of Africa and became a salaried captain in the navy. Nicolas became a soldier at the age of 13; he took part in a battle against the Spaniards in the Mediterranean in 1636, and in the attack of the Îles Sainte-Marguerite in 1637. In 1638 we find him in Acadia, serving as a commissary and storekeeper. He also fulfilled the functions of lieutenant to Charles de Saint-Étienne de La Tour, and contributed to improving the fort on the Saint John River. 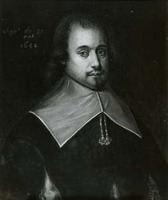 On his return from Acadia in 1639, Gargot was captured by the Spaniards. When he regained his liberty he was assigned to guard the coasts of Brittany. 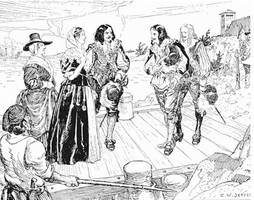 He joined forces with La Tour against Menou d’Aulnay and went to Boston and to France in order to solicit assistance against their mutual enemy, whose fort, situated at Port-Royal, was actually attacked in 1643. Having been made an artillery commissioner in 1645, Gargot served at the siege of La Mothe in Lorraine, where he lost a leg. In 1648 he was promoted to ship’s captain, and had a part in the victory at Castellammare. In the summer of 1650 he set his course for Newfoundland, where he had differences with some Spanish fishermen. The following year he was taken prisoner by his mutinous crew and turned over to the Spanish authorities. On being set free, he went back to France and applied himself to the service of his country. In 1658 he was admitted to the Ordre de Saint-Michel. At about that same time the king granted him the port of Plaisance (Placentia) as a hereditary fief, including with it a grant of land 26 leagues in depth on the south shore of Newfoundland. In 1660, a royal commission did indeed name Gargot Comte de Plaisance and governor of the island. The minister of finance, Nicolas Fouquet, who had private interests in this region, was not without a hand in this appointment. When the English trespassed on his fief, Gargot set out at the head of a naval expedition and seized the settlements at Grand-Plaisance, Petit-Plaisance, and Petit-Paradis. The following year the king acceded to a request made by the inhabitants of the region and duchy of Brittany, and forbad Gargot to molest them when they were fishing off Newfoundland. Gargot set sail for that island in the Aigle d’or and the Flûte royale in July 1662. On the voyage, which lasted four months, scurvy claimed several victims. The following year, Gargot undertook the same trip in the Aigle d’or and the Jardin-de-Hollande. Only the latter ship, commanded by Cap. Jean Guillon, landed at Newfoundland; the Aigle d’or continued on to Quebec carrying the first bishop of Canada, Bishop Laval*, Governor Saffray de Mézy, the commissioner Gaudais-Dupont, and a certain number of troops. At Plaisance, Guillon learned that the previous winter the soldiers of the garrison had assassinated Governor Du Perron, his brother, and the chaplain of the fort, and had then begun killing one other. He managed to capture some of the culprits and brought them back to Quebec where Gargot tried them and had one of them hanged on a raft off shore. After returning to France, Gargot made a trip to Sweden in his country’s service and returned seriously ill. He died three months later, leaving his wife but no children. Thus ended a life dogged by trials and misfortunes; among others he had suffered from the ruinous partnership to which Maréchal Louis de Foucault de Saint-Germain-Beaupré, Comte Du Daugnon, had subjected him in 1649. The latter, a vice-admiral and subsequently governor of Brouage and La Rochelle, was not satisfied, in return for his modest share in the expenses, with a third of the prizes, and had extorted 242,000 livres from Nicolas Gargot. Had it not been for a pension of 2,000 livres he obtained from Anne of Austria, Gargot would have starved to death. His career, as brilliant as it was active, was characterized by courage, zeal, and loyalty to his country. ACM, B.218. AE, Mém. et doc., Amérique, 5, ff. 40–41v. AN, El, 347A, f334. BN, MS, Baluze 149, ff. 5, 10, 11–12v, 93; MS Fr. 22643, f.82, MS, Mélanges Colbert, 109 bis, f.847; NAF 9281 (Margry), f.153–153v, 9282 (Margry), f.224; Acadiensia Nova (Morse), I, xxii, 40; II, 49–54, 67–68, 74, 98–101. [Pierre Groyer], Mémoires de la vie et des aventures de Nicolas Gargot, capitaine de marine [Paris, 1668]; Les aventures du rochelais Nicolas Gargot dit "Jambede-Bois," éd. Charles Millon (La Rochelle, 1928). Jug. et délib., I, 6. William Hubbard, A general history of New England from the discovery to MDCLXXX (Mass. Hist. Soc. Coll., 2d ser., V, VI (1815); reprinted 1848), II, 478–79. A. Jal, Dictionnaire critique de biographie et d’histoire (2e éd., Paris, 1872), 474. La Morandière, Hist. de la pêche française de la morue, I, 18, 220, 409–16. L. Maschinet de Richemond, Les marins rochelais (2e éd., Niort et La Rochelle, 1906), 29–41. P.-G. Roy, “Une exécution capitale dans le porte de Québec en 1663,” BRH, XXIX (1923), 137–40; “Les familles de nos gouverneurs français,” BRH, XXVI (1920), 261–62. Régis Roy, “Nicolas Gargot,” BRH, XXIX (1923), 178. J.-Roger Comeau, “GARGOT DE LA ROCHETTE, NICOLAS,” in Dictionary of Canadian Biography, vol. 1, University of Toronto/Université Laval, 2003–, accessed April 26, 2019, http://www.biographi.ca/en/bio/gargot_de_la_rochette_nicolas_1E.html.